I've reviewed a number of titles in the Quilts of Love series, and I am still really enjoying these. A new book releases every month, and so far they have all been fairly light and easy reads. I love the idea of the focus on a quilt -- "Quilts tell stories of love and loss, hope and faith, tradition and new beginnings." is how they put it. 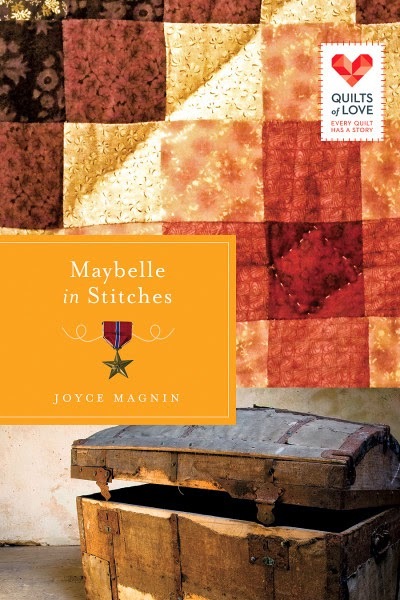 Maybelle in Stitches is a historical fiction title by Joyce Magnin. Set is World War II, and featuring a recently married (as in married mere weeks before her husband shipped off to Europe) young woman, this is a bit different. Maybelle works at a shipyard, welding seams on warships. And eventually, in the evenings, she starts working on an unfinished crazy quilt of her recently deceased mother, stitching seams. Only Maybelle can't sew. Nor is she really any good at any of the domestic stuff. Her mother had always just done everything, and Maybelle is left to deal with a lot -- grieving her mother, worrying about her husband, wartime rationing, worrying about her friends. Her best friend pushes so that they start a little quilting circle, and that little group of women provides support through some of the ups and downs of wartime life. The detail that Magnin puts into this story is fabulous. It really comes across that she knows a bit about life on the homefront during the war. So much is just woven into the storyline without being a big deal. Giving a synopsis of the story would involve a constant stream of bad news for one quilting circle member after another. It sounds depressing, but this book is not a downer. In fact, it is actually quite uplifting. So many things I've read about "The Greatest Generation" come so close to worshiping that generation. This story just seemed more real. Yes, Maybelle and her friends are doing a lot -- welding ships, taking care of the home front, writing to their men overseas. Their men are off fighting in Europe (I'm pretty sure they were all in Europe anyway). But Gagnin's storytelling doesn't lift them up as being larger than life. They are crying themselves to sleep, they are worried, they are trying to trust in God. But meanwhile, they keep on doing the next thing that has to be done. Life is totally different now, seventy years years later. And maybe we now lack some character qualities and know-how to be able to deal with rationing. I think, though, that Maybelle taught me that it is all those individual decisions to put one foot in front of the other and just keep going that add up to make a life well lived. You can see what others had to say about this at the LitFuse Tour Page!